The society was founded by Cissie Eppel in 1992 to bring together people interested in pursuing their Jewish family history. Cissie was succeeded as president by Catherine Youngren in 1998. A non-profit, the society was originally named the Jewish Genealogical Institute and became the Jewish Genealogical Society of British Columbia in 2015, when Stephen Falk became the president. Past and Present Board Members of the JGSBC: Ed Goldberg (left), Cissie Eppel (founder; front centre) Catherine Youngren (right centre) and Barbara Freedman (right). Our founder, Cissie Eppel, z’l, passed away on September 30, 2017. 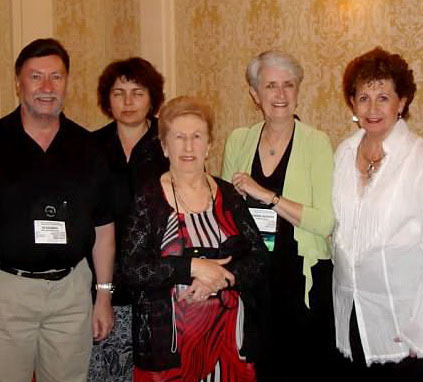 Membership in the Jewish Genealogical Society of British Columbia is open to all regardless of religious affiliation or level of experience.Our members range from those hoping to start tracing their family background to long-time family researchers. at Temple Sholom, 7190 Oak Street, Vancouver.